TWG Tea on the Bridge, Marina Bay Sands, Singapore - my name is Food. 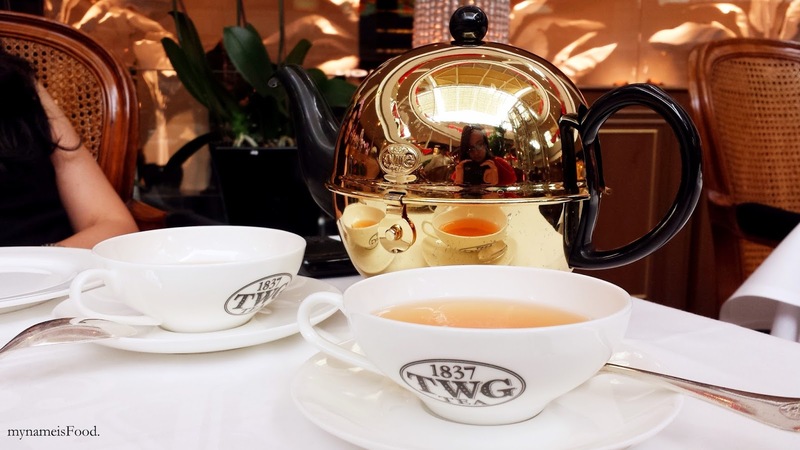 TWG Tea on the Bridge is just one out the outlets located around Singapore as well as in other countries now they have expanded overseas. TWG (The Wellness Group) Tea is one of the finest luxury tea brand in the world being established in Singapore in 1837. 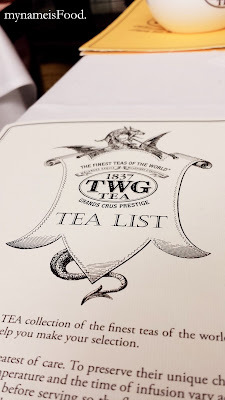 Having tea tasters travel around the world sampling hundreds of teas, TWG Tea offers over 1000 single estate fine harvest teas as well as exclusive blends along with their variety of tea patisseries and also tea infused delicacies. Its tea collection is considered to be one of the largest in the world committing to offering teas directly from source gardens. Whilst being in the heart of Marina Bay Sands, for those who can get bored or just want a quiet peaceful place to have a simple lunch or even just nibbles or sweets along with a nice warm cuppa, this may be the place to go. 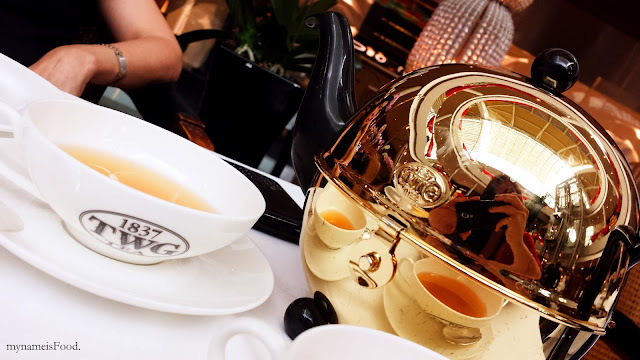 Of course, if you would like a more authentic Singaporean food, then I would definitely suggest going to its food court where you would be able to entice yourself in the world of many food stalls and many different food to order. 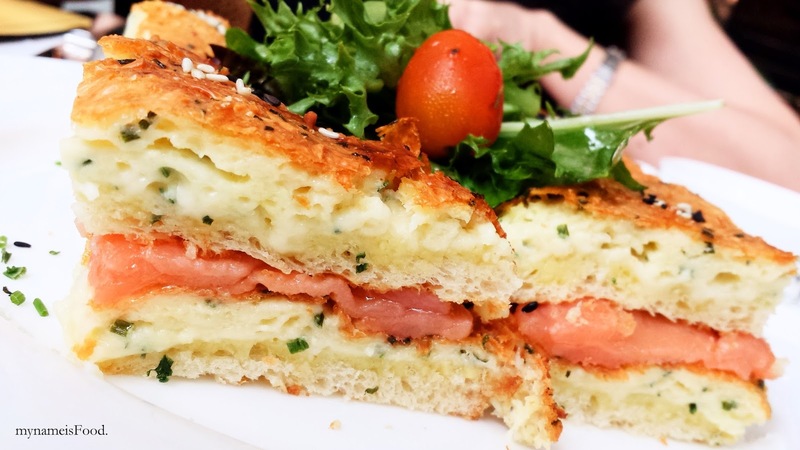 'Croque Salmon' (SGD$18 - AUD is similar or as parity with a dollar to a dollar so for this post, I will leave it as is in Singapore Dollars) is a classic. 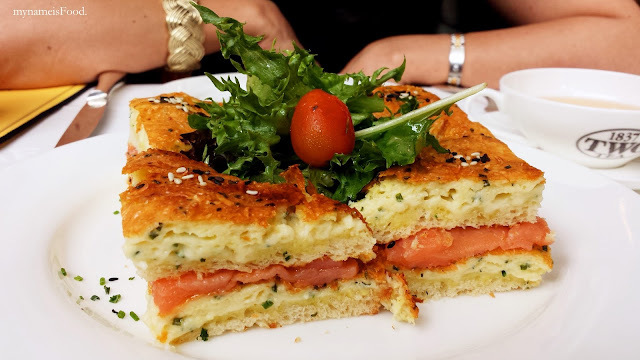 Although a more classic version of this would of course be the Croque Monsieur but this was a much better option I think as I'm a huge sucker for anything salmon. I could just eat it everyday.. A warm toasted sandwich with French Comte cheese, sprinkled with 1837 Black Tea ground leaves and smoked salmon served with a delicate green salad and house vinaigrette. 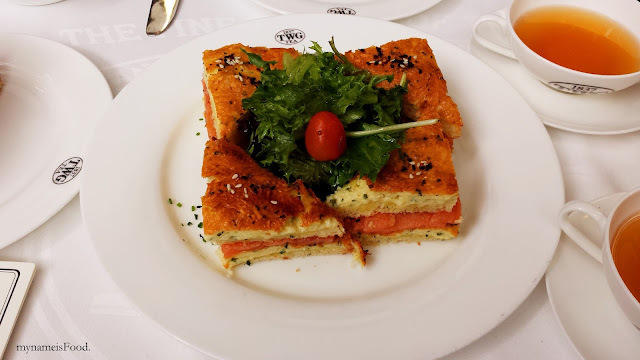 As you can see that the bread has been combined and cooked along with egg, to give it that upper crust, also the mixture of the dryness of the bread and the soft fluffy egg texture as well. The smoked salmon was quite thin in slices wise so I would have liked to have a bit more, the delicate green salad was placed on top and consisted of basically a few rocket pieces and a tomato which I did not neccessarily think you would be able to call it a real garden salad but I guess everyone has their own way of serving and naming things. The tea leaves were more of a decor than something you would find inside the sandwich infused to give it a more unique taste. Overall, it was refreshing, fresh and simple sandwich to have. 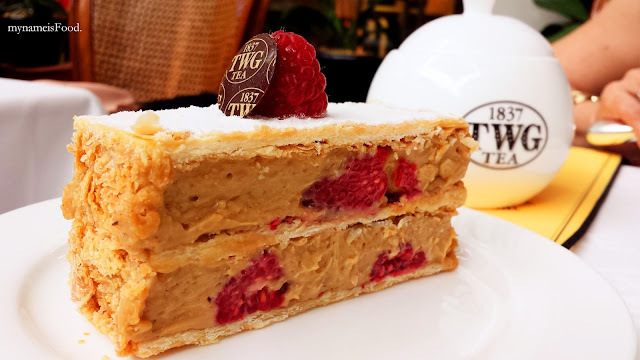 'Mille Feuille' (SGD$9.5) is a classic Mille Feuille cake but with an interesting twist of having a caramelized sugar infused custard cream with vanilla bourbon tea instead of your usual full Vanilla. A light cake with quite of a densed filling though the pastries in between seemed airy and crispy, it was hard to try and slice or even try and take a fork-ful of it bit by bit as the pastry would not crack nor easily slice making it all messy in the end everytime you would try and get a bite out of it. Its topping is as usual coated with icing sugar but on the sides it seems to have had pastry flakes coated. 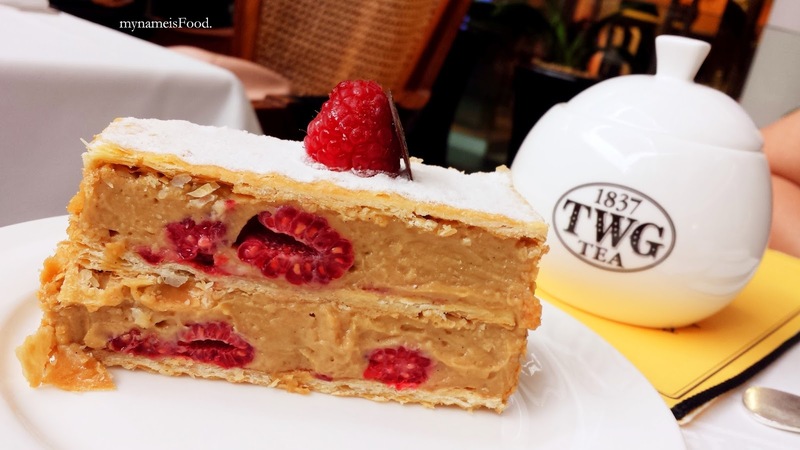 Raspberries were combined into the Mille Feuille giving it a fresher and fruitier feeling and taste. 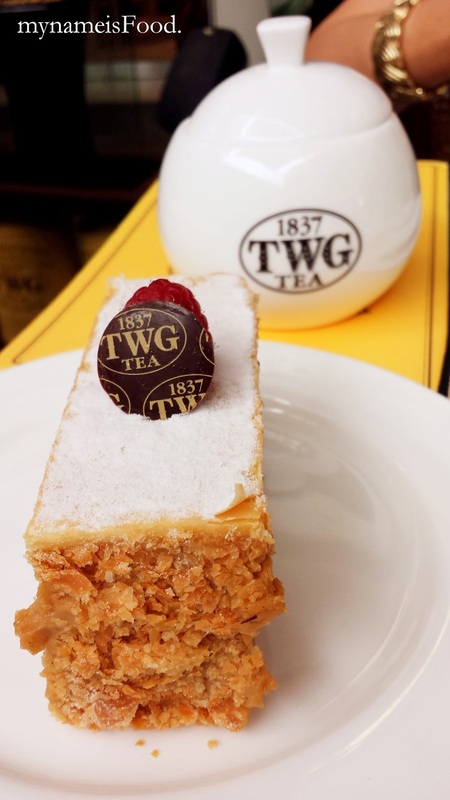 The caramelized sugar and vanilla infused custard cream worked well with the raspberry but I didn't find it as nice as I thought it would be. 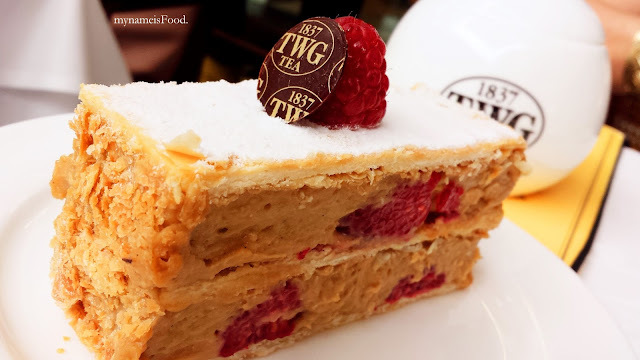 Although it was different I should say, I would prefer the normal and original Mille Feuille if I had to choose. 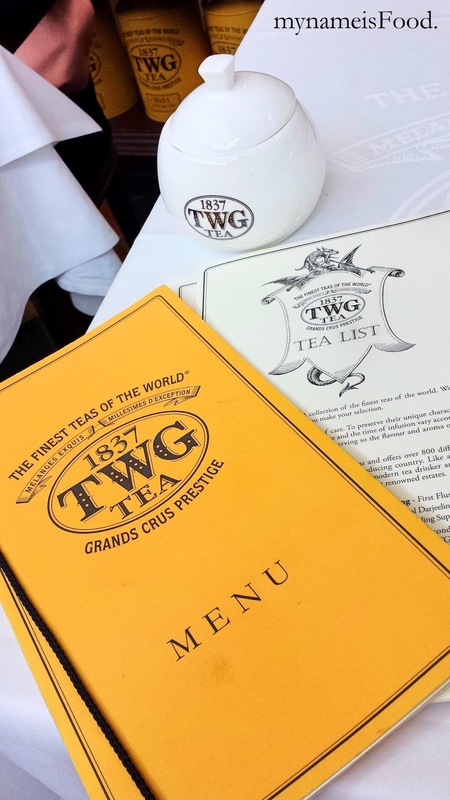 Do try their High Tea and try out their various teas on offer as you might be surprised at the wide choices you will have infront of you.